Old Hutton is in the old county of Westmorland and its roots go very deep. It is full of hardy folk who are friendly and loyal and who certainly know how to put on a great spread for visiting townies. Every year for at least 6 years the village has hosted the event "Spring into Old Hutton" organised by the "Bowland and Morecambe Bay" branch of the LDWA - the Long Distance Walking Association and the Village Hall is the centre of this event. The weather is always fine! There are 2 plaques in the hall. One made of fine and well preserved wood commemorates those who served in the Great War and the other one is a appears to be a paper version but beautifully written in a frame commemorates those who served in the WW 2., There are also old photographs in the village hall. They are clearly fond of their village, and with good reason because it is indeed beautiful. It still is very agricultural and has a mixture of lowland and hill pastures. The village is overshadowed by the "Helm" which I believe has an Iron Age fort on the highest ridge. 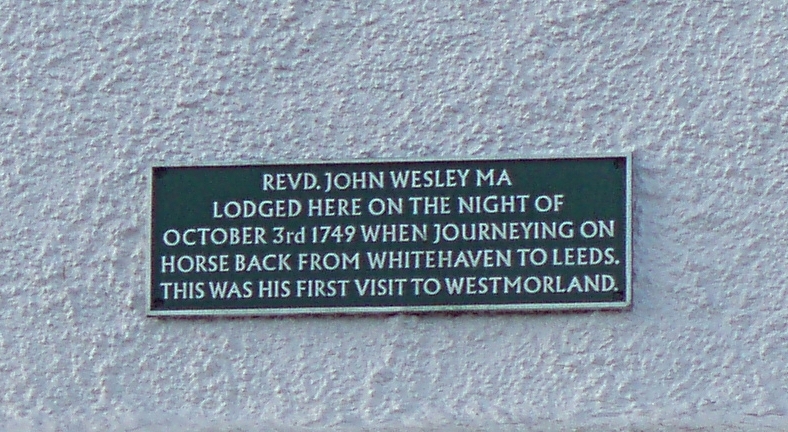 Perhaps the most interesting thing in the village is the plaque on one of the houses opposite the church which states that John Wesley stayed in the village in 1749. There is much evidence of pack horse trails in the area. The local area abounds with what appears to be old packways and bridal ways.